Who faces greater discrimination: ethnic minorities, or white people? 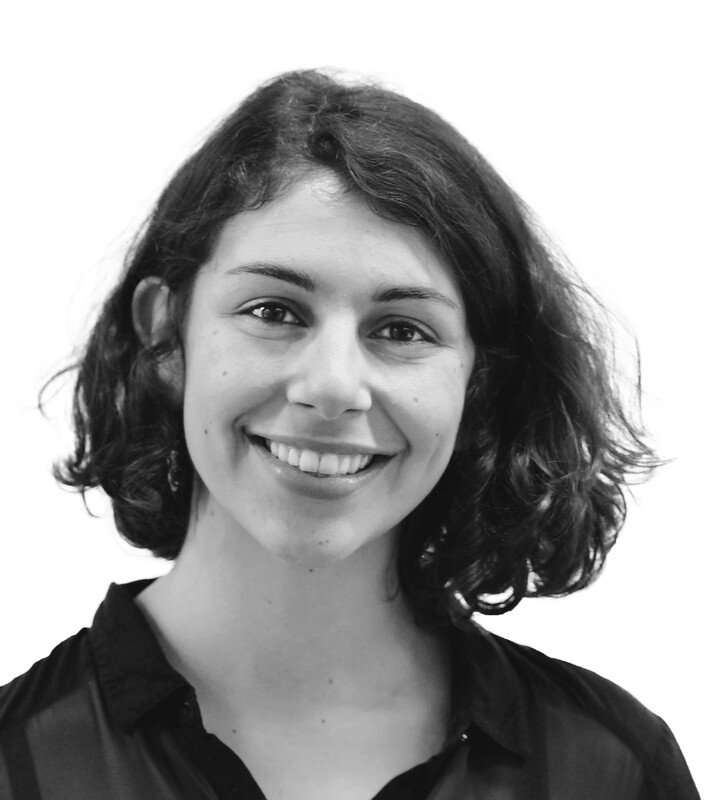 December 20, 2018, 9:59 a.m.
A new YouGov survey conducted in collaboration with the Guardian explores what Britons mean when they talk about racism: what does and doesn’t count as racist, to what extent is it present in society, and who faces greater discrimination in specific areas of life: ethnic minorities, or white people. When asked to what extent racism is present in UK society just 1% say it no longer exists, while another fifth (20%) say ‘not very much’. But half (52%) say it exists ‘a fair amount’ and a fifth (20%) say it exists ‘a great deal’. 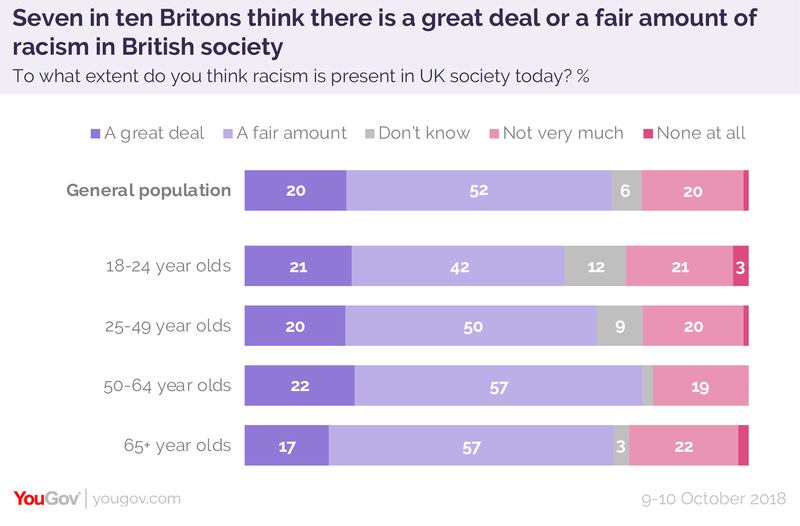 Those aged between 18 and 24 are only eleven percentage points more likely than those over 65 to believe racism exists a great deal or fair amount (63% vs 74%). However, men are almost twice as likely as women to say it does not exist very much or at all (27% of men vs 17% of women). Building on the question of whether Britons thought racism existed in the UK, the survey asked respondents to be more specific in their description of where and how racism occurs: namely, whether they think people from ethnic minorities in the UK face greater or lesser discrimination than white people in a number of different areas of life. In every area asked about in the survey – from schooling, to jobs, to access to finance Britons were most likely to say people from ethnic minorities face no difference in levels of discrimination, except for ‘interactions between strangers’ (41% greater, 14% lesser, 29% no difference). 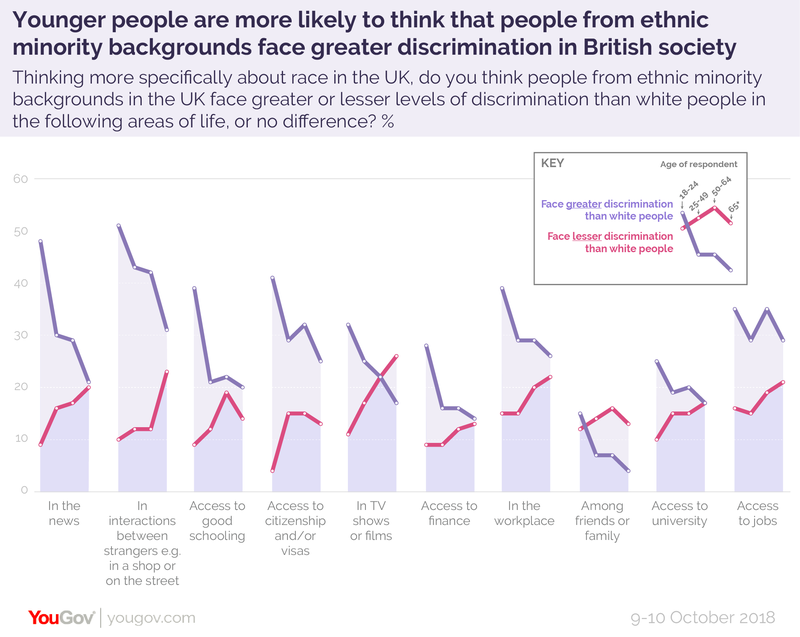 The majority of the population think people from ethnic minority backgrounds face no more discrimination than white people in the news (53% vs 30% who say they face greater discrimination), in TV or films (60% vs 23%), in the workplace (54% vs 29%), and in access to finance (57% vs 17%), access to jobs (52% vs 31%), university (52% vs 20%) or good schooling (54% vs 23%). Six in ten (61%) believe there is no difference in discrimination faced by people of an ethnic minority background or white people among friends or family. Around a third of Brits feel people from ethnic minority backgrounds face greater discrimination than white people in access to jobs (31%), access to citizenship or visas (30%), in the workplace (29%), and in the news (29%). When it comes to interactions between strangers - e.g. in a shop or on the street - four in ten Brits (41%) feel those from ethnic minority backgrounds face greater levels of discrimination. In all areas, between one tenth and one fifth (10% to 20%) felt people from ethnic minority backgrounds face lesser discrimination than white people – in other words, white people are more strongly discriminated against. Brits were most likely to think people from ethnic minority backgrounds face less discrimination than white people in relation to TV shows or films, and in the workplace (20% and 18% respectively). 18 to 24 year olds are twice as likely as those aged 65 and above to believe people from ethnic minority backgrounds face greater discrimination when it comes to access to schooling or finance, and in the news, TV, and films (39% vs 20%, 28% vs 14%, 48% vs 21%, 32% vs 17% respectively). Conversely, those aged 65 and above are more than twice as likely to think white people face greater discrimination than people from ethnic minority backgrounds when it comes to the news, interactions between strangers, TV and film, and access to citizenship (20% vs 9%, 23% vs 10%, 26% vs 11%, and 13% vs 4% respectively). On the whole, most Brits think people in the UK are uncomfortable talking about race. Seven in ten (67%) think we are either &apos;fairly uncomfortable&apos; or &apos;not comfortable at all&apos;, with next to no variation along gender, age, or political lines. 18 to 24 year olds are slightly less likely to think Brits are uncomfortable talking about race, with six in ten (57%) saying so. People who say not much racism exists in society are more likely to say people in the UK are comfortable talking about race, with just under a third (31%) saying so compared to just over a fifth (23%) of the population as a whole.